New Canadian city website caters to the informational and service needs of citizens, visitors, and local businesses. It is really gratifying to give Canadian municipalities the freedom to choose the best features and hosting options for their needs. 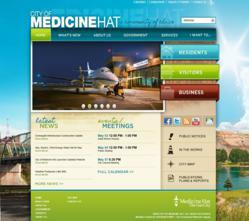 The City of Medicine Hat, Alberta is the latest Canadian city to launch a new website created by Vision Internet. Focused on the individual needs of the community, http://www.medicinehat.ca boasts a welcoming design, intuitive navigation, and interactive content. Powered by the government content management software - the Vision CMS™, the new Medicine Hat website addresses the many shortcomings of the old site. The previously stagnant, outdated homepage has been replaced with a vibrant, interactive design that encourages the audience to explore the website. It also includes dynamic news and calendar feeds that stream breaking news stories and upcoming community events. Another important fix was restructuring the website with a user-targeted navigation system based on successful government website best practices. No longer categorized by department, information and services are organized from the user’s perspective. Three large buttons on the homepage labeled “Residents”, “Visitors”, and “Businesses” as well as an action-oriented “I Want To…” menu found in the main navigation simplify what was once tedious searching for website visitors. While having the option to host the site on Vision Internet’s Canada-based servers, Medicine Hat chose to host in-house. This gives them greater flexibility to customize the source code and integrate their own custom applications. Other Canadian municipalities like Whitehorse, YT and Thompson, MB prefer the convenience of Vision Internet’s reliable hosting platform. “It is really gratifying to give Canadian municipalities the freedom to choose the best features and hosting options for their needs,” said Project Manager Jason Schatz. Vision Internet offers Canadian government agencies a free consultation of government website best practices plus free demonstrations of the innovative government content management system, the Vision CMS™. To take advantage of these free resources, please visit http://www.visioninternet.com/freedemo. Vision Internet is the leader in government website development with over 400 clients across the United States and Canada. For 16 plus years Vision Internet has been creating industry-defining websites built on leading technology including the powerful government content management system, the Vision CMS™. Widely recognized as the best government website vendor, the company has earned hundreds of prestigious industry awards for its unique websites. Reinvigorating the eGov outreach of every community they serve, Vision Internet has earned the title of the Government Website Experts.